This has been described as being very simple, but then are not some of the most successful items in production today been simple, but nonetheless very functional and guaranteed to do the job for which they were intended perfectly? The Rolls Secret Box has achieved great success; this is witnessed by the number of orders that have been placed for it. 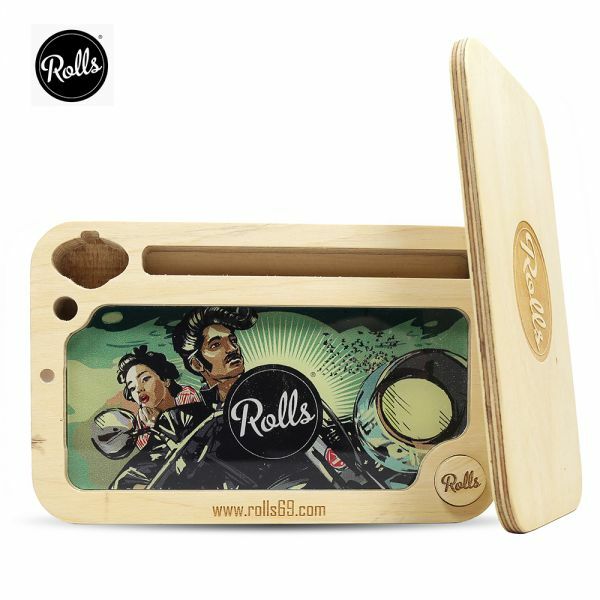 We say that it is functional; it does exactly what is described on the packaging, the secret compartment where you can keep special items or your herbs or other smoking bits is found beneath the rolling tray, which is easily removed by pressing down on the tray just above the Rolls logo in the centre, just how clever is that ? This stylish little rolling box is made from 2.5cm thick plywood and the plexiglass has a neat illustration on the face. It is a perfect size to carry in the pocket or bag measuring 16cm x 10cm x 2,5cm, this Rolls Secret Box with rolling tray is the perfect roll base and mixing bowl to have everything in one place, at just £28.00.